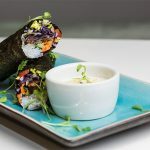 This recipe for vegan nori rolls has been created by Louise Palmer-Masterton who is a founder of Stem + Glory restaurant and a long-term vegan who’s been experimenting with plant-based foods for more than 30 years. Louise loves clean and healthy Japanese cuisine and says that it’s incredibly easy to ‘veganise’ many Japanese recipes. 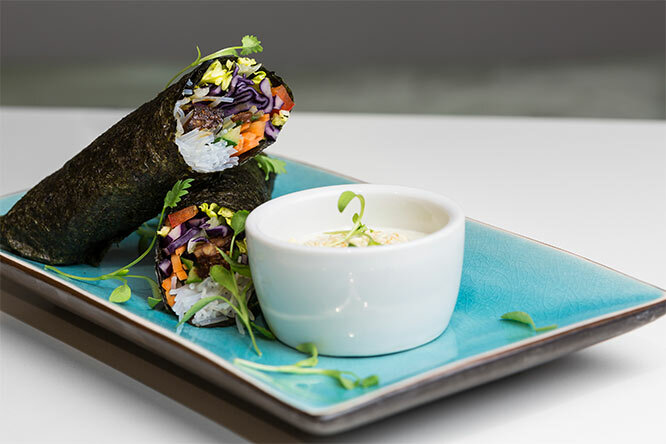 These vegan Nori rolls are a firm favourite at Stem + Glory restaurant on Bartholomew Close. You can use different crunchy vegetables for this recipe, if you prefer, and you can also make the nori rolls without noodles. This recipe uses tofu, but at Stem + Glory they also use marinated tempeh for that so you could use that if preferred. First, make the dip. Blend all the ingredients until the mixture is super smooth. Add more wasabi according to your preference. Next, cut the firm tofu into long square strips, approximately 1cm thick. Mix the remaining ingredients together to make a marinade, add the tofu and leave to marinate for 10 minutes. Bake the coated tofu in the oven for 10-15 minutes. Add the sesame oil and rice noodles to boiling water and cook or stand according to the instructions on the packet. Stir to avoid the noodles clumping. Drain and rinse the noodles with cold water to quickly stop the cooking process. Peel the carrots. Thinly slice the red pepper, cucumber and carrot to 5cm in length and 2cm in thickness. Slice the cabbage and lettuce in fine strips on their side, to preserve the ‘wavy’ shape. Dampen a clean cloth slightly and then place the nori paper on top. Moisten slightly, and then place a handful of Rice Noodles, 3 batons of Red Pepper, 3 batons of Cucumber, a large pinch of Cabbage, the same of lettuce and two pieces of Tofu on a quarter of the sheet closest to you. To roll, fold the edge closest to you over the filling and tuck it under, then roll that over the remaining nori paper. To stick the ends down, wet the edge and press firmly. Slice the roll into four pieces at a diagonal and serve with the wasabi dip. 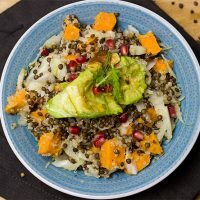 Louise Palmer-Masterton is founder of multiple award-winning restaurant Stem + Glory; a hip and trendy but accessible plant-based restaurant, serving delicious gourmet vegan food from locally sourced ingredient 100% made on site. 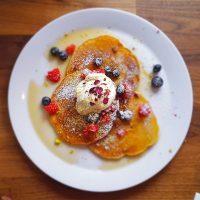 Stem + Glory offers all day casual fine dining, fast breakfast, brunch and lunch, juices, smoothies and great coffee. All available to eat in or take away. Stem + Glory also offers mouth-watering and hugely popular tasting menu evenings and special event menus. The restaurants have an extensive vegan bar, offering the best craft beers and fine wines, alongside cocktails, mocktails and smart drinks.